I’m at a loss. I’m having trouble trying to understand why Sam Mendes’ new breathtaking film isn’t getting the credit it deserves. For two authentic hours, audiences intrude on the lives of April and Frank Wheeler, a well-to-do couple in 1950s Connecticut. Frank works in New York City at a job he hates marketing electronics. April stays at home, watching their two kids, becoming envious of the life she could have had. April comes up with a plan to rejuvenate their lives and put a little spark back into their marriage. The plan (which I won’t reveal) sets in motion one hell of a tumultuous movie. Mendes’ new film is similar to his first, American Beauty, in the way that it depicts a side of suburbia that we’ve never seen. But it’s different in the way that it depicts how a marriage can quickly, and steadily crumble. Frank and April engage in long, ferocious arguments that feel almost too real to watch. And there, I suppose, lies the problem for some people. 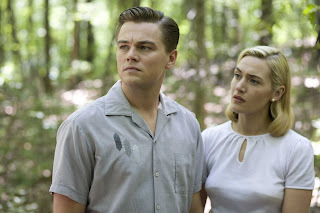 Based on Richard Yates’ famed novel, Revolutionary Road, isn’t for a faint heart. It slams its character’s problems right down your throat. If you want escapist film, you’d better look elsewhere. Having said that, this movie is an affecting triumph. Leonardo DiCaprio as Frank, gives the best performance of his beautifully matured career. He’s long gone from that man-child he played on that giant boat with his costar. Frank is kind, dismissive, brutally angry and most of all, clueless. He has no idea what his wife likes, wants, or needs. He’s a mess of a man. This really is Kate Winslet’s year. Her work in The Reader is astounding; unlike anything she’s ever done, and in Revolutionary Road, she excels even further. She stretches April’s emotions as far as any movie character this year. She’ll rack up two nominations this year in both female acting categories. I don’t know which one she’ll win but I say to hell with it, give her both. There isn’t one specific scene of hers to highlight in this film. From the first moment you see her, you won’t be able to take your eyes of her. The fact that she is married to Mendes in real life makes me appreciate her April that much more. Likewise for scene stealer Michael Shannon, who plays John, the son of Kathy Bates’ real estate agent character. Recently released from a mental institution, John is the only “real” character in the film. He has no filter in his head that allows us to keep our mouths shut. He says what he wants, when he wants, often to shocking conclusion. I’m dumbfounded as to why Shannon hasn’t been getting Oscar buzz (although he wouldn’t beat Heath Ledger). As one of the best character actors around, Shannon will make you cringe in this film. Good review...excellent film. As I said to you.....this is a cross somewhere between American Beauty and Who's Afraid of Virginia Woolfe, yet it's an original film. One of the few films that I kept repeating to myself, This is only a movie, only a movie. I'll see it again and probably again after that. Oh my f***ing God, you have done it. You've gave an A+ to my absolute favorite movie in the world. I'm just...done. Ha, glad you dig it man! I really need to give this one a rewatch.